Here's a tiny little owl. When you see it in a raptors show, it can sit on the handler's finger. It eats mostly big bugs, it's that small. 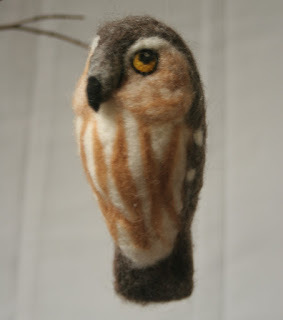 I think I'll be making a bunch of owls and detailed birds this summer. Market season opened yesterday for me, with the Trout Brook Farmer's Market in West Hartford; the woodpeckers and owls were getting a lot of attention, so I'll be busy felting! Hei:) Your owl is absolutely lovely ! I`m glad you have a busy felting time ahead of you !